A promise kept | Walk with us! Fr. Tom took this photo in 2014 when this year’s novitiate class were postulants. Today is my last day in Eluru; tomorrow after lunch Fr. Mariano, scj, will drive me to Nambur. The whole purpose of extending my time into the hot season was so that I could attend the first vows of the current novice class. 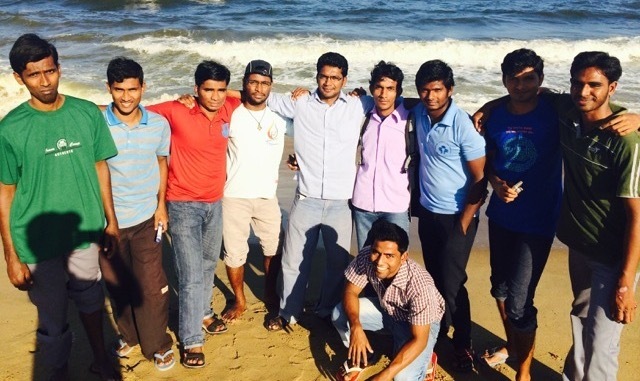 I grew to know this novice class last year when they were postulants and their program was held in Eluru. [Fr. Tom was assisting in the formation program at Eluru last year] Normally the postulancy would not be housed in the theologate but due to the small numbers of theologians (eight) the postulants were there in part to help maintain the house. The low number of theologians was due to a change in the district formation system that ended up with only the first and second year theologians in the house following the first semester of the 2013-2014, school year. The low numbers were also in part due to four of the theologians from the first two years being sent to Cameroon and Venezuela to learn the language and do their theological studies in these two countries. When I knew I would be coming back to India this January I told the novices that I would arrange my trip so that I could attend their first profession before returning to the States — even though I was well aware this is now the hottest time of year in this part of India. Because of the heat the Mass for the first vows will take place at 6:30 am! 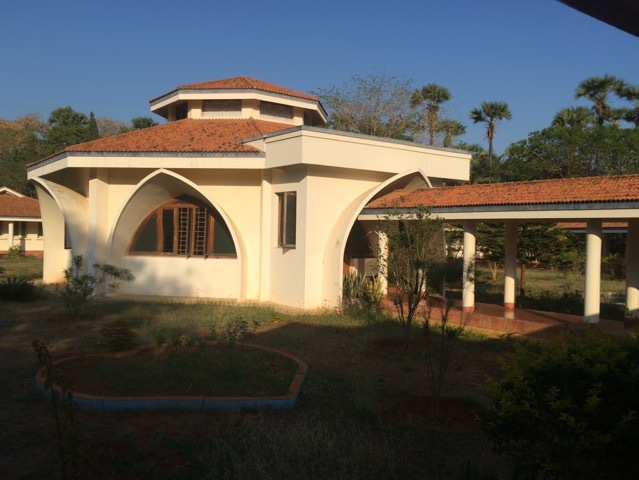 Our Nambur novitiate house is built in the style of an Indian ashram. Unfortunately the architects did not take into account the summer climate in Andhra Pradesh. Many of the rooms, including the individual bedrooms of the novices and staff, are not well designed to dissipate heat. Add to that the frequent power outages when fans and the few rooms that are air-conditioned do not function makes Nambur a difficult place to live and work from April to well into June. Nambur has installed a solar photoelectric system but it has had problems of its own so that as of this moment it too can’t be relied on to provide a steady supply of electricity either during the day or by battery at night. Happily they are working to resolve this issue. Despite the problems of heat the campus itself is conducive to a novitiate’s contemplative atmosphere. I particularly like the chapel with its stain glass window of the Sacred Heart. 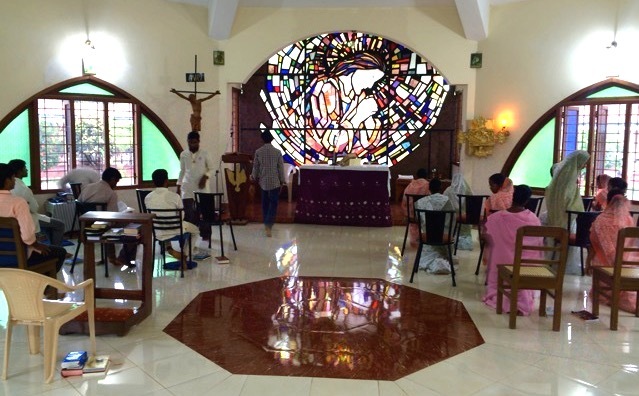 Our philosophy house in Aluva, Kerala, also features an Indian-styled Sacred Heart figure.